I'm guest posting today. I hope you will go and visit with Jen, my very-gracious hostess. When I started blogging, I had hoped I might reach some people at a great geographical distance to myself. One of the very best bloggers who comes visiting from across the world is Jenaisle. She is always encouraging, invariably kind and she keeps a number of very remarkable blogs of her own. In the few guest posts I have done, I try to provide something that is in keeping with the content of the blog I am visiting. I knew I would have to do a new memory-story for my spot on Gewgaw Writings so that's what I did. As is often the case, it concerns a fairly stupid thing I did , the difference being - this one is recent... too darn recent! That's why I called it 'Still Stupid After All These Years.' I hope my misfortune raises a grin. Thanks to Jen for asking me to post. Working it all out with her has been a genuine pleasure. The pleasure is mine Ken, thanks for being my guest blogger. 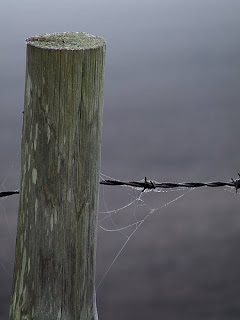 I *love* this fence post picture, doesn't it have an amazing 3D quality to it? Kudos to the photographer - click on the photo and you can see some more of his work. Ouchy, that made me laugh and I love the fence post pic also! It just doesn't seem right to laugh and enjoy a story this much. :) Then again, considering what happened when I tried to fix a treadmill 2 weeks ago that I thought was still unplugged.... let's just say I feel your pain. My ribs remained in tact but my knees weren't happy. At least the bruising was colorful. Heading over to view the post now. Can't wait! Hi Sorlil, 'makes my day when someone laughs so thanks for that, great blog you have too! Hope, your treadmill story sounds like it's worth getting out there - I can't be alone in all this confessed pain. I've added you to my Firefox Speed Dial so I can make sure not to miss your fantastic stuff! Hi Tasha, you've come over here to prod my ribs a bit, go on admit it :) Well, join the queue, it's over there beside that fence. Cool Rachel, I want to be Compo, he got all the best stunts... plis Nora Batty. Hi Kat WATCH OUT!! BAM! Oops, Irish Drivers! Nip over to Kat's place - you'll see what I mean. I read your guest post and it was a great read! I am sorry that I laughed at your misfortune and I'm sure it wasn't funny until you realised you were okay! Hi Sarah, I enjoy your blog a lot. Can I come back to you on that one? A 'rain-check'thingie?? I appreciate the offer and would like to take you up on it soon.